Street performance is the act of performing (such as singing or playing music) in public places for gratuities, wherein the rewards are generally in the form of money but other gratuities such as food, drink or gifts may be given. 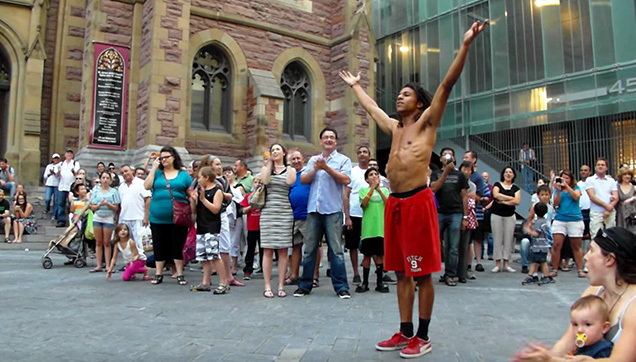 Street performance is practiced all over the world and the video is an example of an amazing street performance in Montreal, Canada. Snap Boogie wows the crowd with his funny antics and amazing acrobatics. The performer's name is Snap Boogie who was born and raised from Boston, Massachusetts. Not only did he performed impressive stunts, he also included a hilarious skit, making his performance extra special. He started off with asking for a volunteer, to which a kid was chosen. He made the kid stand a few feet in front of him to which before he did an impressive flip over the kid's head, he told a few jokes here and there. Snap Boogie asks some volunteers to line up. Incidentally, Snap Boogie once joined America's Got Talent Season 6 but was eliminated in the semifinals. During then, he revealed that he practiced street performing and entertaining crowds all over Boston during his time off from school. He spent many hours practicing and coming up with his own choreography, using his skills and natural ability to "freestyle" to which the fantastic result you'll be able to watch in the video!